Serving South Plainfield Since 1984! Ciccio’s Pizza. 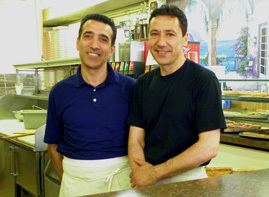 It’s like a taste of Italy right here in South Plainfield Family owned and operated by brothers Sev and Phil since 1984. At Ciccio’s we proudly serve the best pizza in town! Each pizza starts with our own recipe that has been in our family for generations. Our sauce is home-made daily, using only the freshest highest quality ingredients. We top all of our pizza with the finest cheese available. You can count on our consistency for quality pizza, dinners, subs and more because at Ciccio’s we care about our customers. Give us a call now! Sunday 2 Medium Cheese Pizzas $13.95 plus tax. Mondays 1 Large Cheese Pizza $8.99 plus tax. Enjoy Our Web Commercial...We Appreciate Your Patronage!